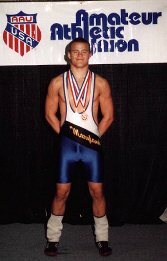 Welcome to Scott McAdoo's wrestling home page; a comprehensive listing of information concerning a motivated young man with big goals and dreams. Please bookmark or add this page to your favorites to make it easier for you to follow the progress of a champion in the making. Disclaimer: This page is maintained by Scott's father, Ron McAdoo. It was originally intended as a way for family and friends, who have asked about Scott's wrestling progress, to keep up with his activities. It is not a reflection of Scott's personal ego (actually, he is somewhat embarrassed by it's existence) as he has little contact with it except for an occaisional review of the guestbook contents. Please excuse a proud father and hold nothing against the son. Thank you. Please sign Scott's guest book and let him know what you think. Thanks! This page has been visited times since December 9, 1997.